Marin Marais was a French composer and viol player. 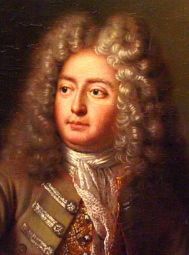 He studied composition with Jean-Baptiste Lully, often conducting his operas. He was hired as a musician in 1676 to the royal court of Versailles, and in 1679 was appointed ordinaire de la chambre du roy pour la viole, a title he kept until 1725. He was considered a master of the basse de viol, and the leading French composer of music for the instrument. He wrote five books of Pièces de viole (1686–1725) for the instrument, generally suites with basso continuo, and for these he was remembered in later years as he who “founded and firmly established the empire of the viol.” His other works include a book of Pièces en trio (1692) and four operas (1693–1709), Alcyone (1706) being noted for its tempest scene.